Why not have Themed or Personalized Champagne, Wine or Beer Glasses at your Wedding Reception? This brings a truly unique and classy touch to your Wedding and one that Guests will be sure to appreciate and remember. 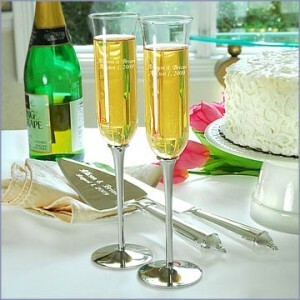 To add even more of a personal touch, you can allow the Guests and Attendants to keep their Glasses as a special keepsake of your wonderful Wedding. You could use a variety of themes. For instance, Pink Glasses for the Ladies and Blue for the Gents. 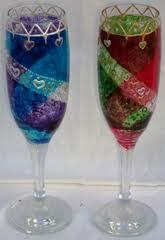 You could have your Initials and Wedding Date monogrammed onto the Glasses. Think about having Old Fashioned Beer Mugs for the Guys to enjoy their Beers. For the Younger Ones, how about brightly colored plastic cups with any kind of kid-friendly theme. 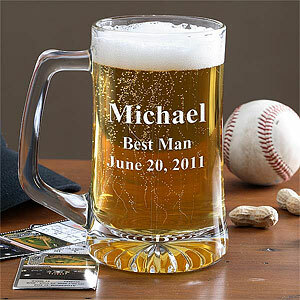 As your Wedding Party are a special part of not only your Wedding Day, but the whole preparation and run-up to your Wedding, your could have a Glass made to suit each individual personality in your Wedding Party. The possibilities are endless! Many online Vendors offer such products and a simple internet search will bring many suppliers to you, such as the popular Kate Aspen Wedding Site. Finally, be sure to order extra glasses in each variety and theme to allow for breakage, unexpected Guest changes and such. Any leftovers will be a start to your Home Collection of Entertaining Ware!